With the help of a Certified EOS Implementer™, your company can achieve its strategic objectives by using a thoughtful, step-by-step approach. 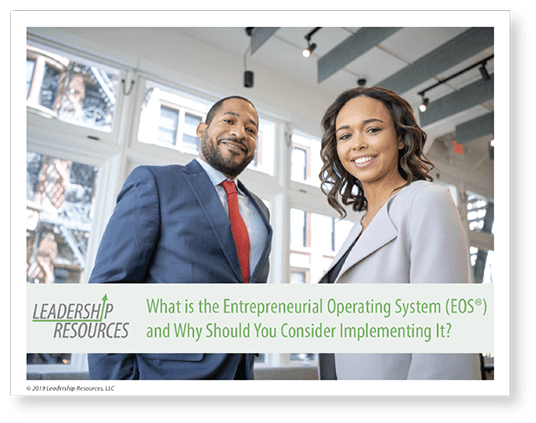 WHY THE ENTREPRENEURIAL OPERATING SYSTEM (EOS®)? Three words: proven track record. This system delivers real, measurable results. Implementing EOS® helps your organization capitalize on its potential. You’ll have the tools you need to make decisions faster (with a better understanding of the different factors that go into them). Implementing EOS® also improves teamwork and maximizes productivity, while building a culture of accountability and continuous improvement. Strategy isn’t one-size-fits all. Leadership Resources will help you tailor your strategic plan to your company, to maximum success. Benefits you can expect from our custom strategic planning services include clarity of your company's vision, mission, and purpose, as well as detailed focus on strategic goals and realistic, achievable action plans. You will also see measurable success in profit, revenue growth, and productivity, plus much more. "Our Certied EOS Implementer™ challenges our group in a calm, professional manner. He asks meaningful questions that make us think more deeply before making a decision. He helps our company achieve our goals and holds us accountable to our commitments."